We're on our way to 100% renewable energy. GRID Alternatives Greater Los Angeles leads teams of volunteers and job trainees to install solar electric systems for low-income families in Los Angeles, Orange and Ventura Counties, providing families with needed savings and giving area workers hands-on experience to help them find employment in the green-tech economy. Since we opened in 2007, we’ve helped over 1,120 low-income families go solar throughout the Greater Los Angeles region. 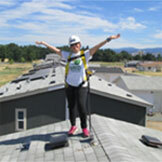 Be a part of the clean energy transition- become a client, volunteer or make a donation today! We believe that men and women who have paid their debt to society are ready to contribute to the public good, and that solar employment holds the key. "When we came back down from the mountain, people said, 'Thank you so much—you saved our homes.' I realized I liked helping people." Last weekend, the Del Grosso family had a chance to see some of that helpful spirit in person! This is the latest in a series of profiles introducing the GRID Alternatives Greater Los Angeles staff.